This week’s text is a sequel to my German entry Fingerfertigkeit. Have you ever seen a German shake their fist at someone? No, I don’t mean in the menacing wait-till-I-get-you! kind of way of James Bond villains. I mean in a kind, encouraging manner, smiling and wishing the other person luck. How does the luck get into the fist is what you’re asking? You’ll find out in a minute. Well, first of all, it’s not a real fist. It’s a fist that as a child in my first ju-jitsu class my teacher told me not to make, i.e. one with the thumb inside all your other fingers. If you punch someone like this, you’ll sprain, if not sever or worse!, your thumb. 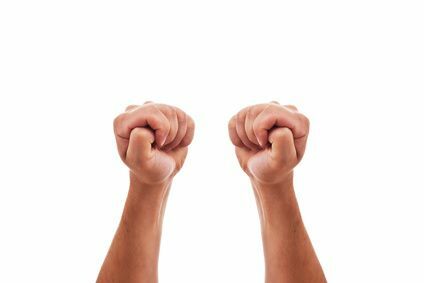 This type of fist is referred to as Daumen drücken (‘pressing thumbs’) in German. And it’s not a fist for fighting. It’s a fist for wishing. A Canadian friend, who suggested this gesture as a blog topic, said when she first heard this expression, she was not sure what to imagine. She thought perhaps people pressed their extended thumb against the thumb of their other hand – or someone else’s. It’s not clear where the thumb-pressing comes from. In one of its episodes, the popular children’s TV show Wissen macht Ah! by regional broadcaster WDR, which explains all kinds of phenomena and is generally a good source of information for learners of German, explains a thing or two about Daumen drücken. This gesture, which is said to be based on the Christian symbol of the cross, is not unknown to Germans. We use it to secretly break a promise we make (this being a common variety of use in several English-speaking countries as well) or to emphasise that two people are really close or get on very well (‘Die sind so!’). Wieder was gelernt, as your German friends will say. Or Man lernt nie aus – you live and learn. Well, fingers crossed you’ll know who’s behind you next week! The Pommes Buddha says: It’s not evil. It’s magic.